Today Facebook unveiled a new look for its right-column ads that should start appearing on your screens “in the coming months.” The good news is that they will be larger with bigger images. The even better news for users is that there will be fewer of them. 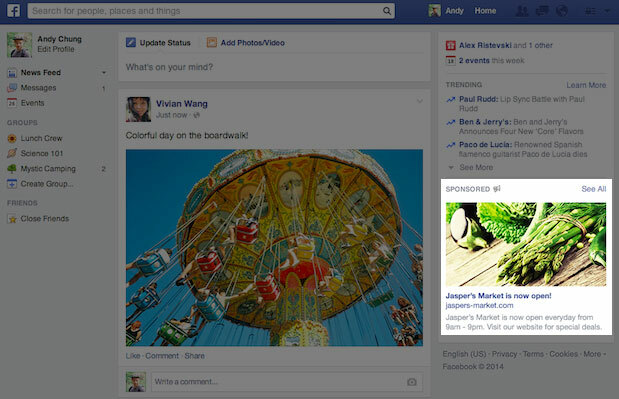 New #Facebook right-column ads will come with larger images. The reason behind this new ad layout is to provide “more visually consistent with the ads that appear in News Feed.” In fact, after this update, right-column ads will have the same proportions than ads within the newsfeed. #Facebook announced new right-column ads with the same proportions than newsfeed ads. At the same time, Facebook is hoping that this change will offer advertisers “a simpler way to create ads and an enhanced creative canvas” on the right-hand column of the desktop site. A better experience for people: The new look of the ads, along with their new distribution, is intended to offer a better ad experience on Facebook. In early tests Facebook claims to have seen increased engagement — up to 3X more — from people seeing the new design. A simpler ad product: Because the updated ads mirror the overall shape of desktop News Feed ads, marketers will no longer have to choose separate images for News Feed and right-hand column placements. They can now use the same image for both. Availability: Some advertisers will begin seeing this new option later this month, with all advertisers being rolled over later this year. During this transition phase, we will support the old and new formats. It comes to no surprise that larger ads will most likely lead to higher engagement. And of course, Facebook‘s considerations cannot be only visual. This update will probably result in more profit for Facebook. #Facebook claims the new larger ads will lead to higher engagement. This announcement follows logically on Facebook’s strategy to simplify advertising on its platform. What do you think of the larger (but fewer) ads in the righ-column?